Japan’s visionary architects and their vision has been recognized and celebrated recently via the Pompidou’s Japan-Ness exhibition in France’s Metz. The creativity and ingenuity of the Japanese architects who are considered to be country’s finest has been put on display. Their solutions for the ‘sprawling urbanism’, which happened in Japan after the Second World War, can actually be adapted today. Japanese visionary architects were in the sway of the avant garde architecture movement and their contribution to it was the ‘Metabolism’ movement. Kenzo Tange was the Japanese architect who started movement, which lasted for almost a decade in Japan. Metabolism incorporated innovative, advanced technology and used modular units in the buildings. 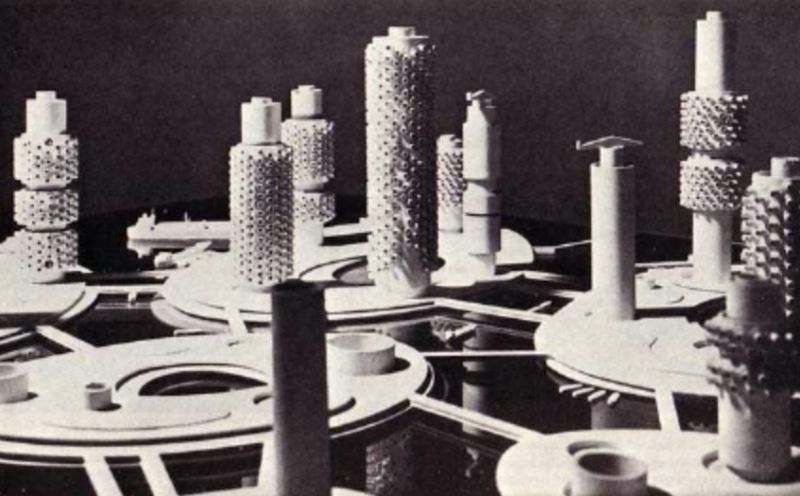 Kenzo Tange, designed the ‘Plan for Tokyo’ design concept for the city of Tokyo in 1960. This happened during Japan’s urban development wave in the fifties and sixties. He designed the project in a manner that the city could accommodate expansion, which was bound to happen in a growing metropolis. He solved this problem by creating beautiful architecture that connected places across Tokyo Bay. Japanese visionary architects such as Kenzo Tange opened up the thought for the future, and showed the way in which to do it. His designs paved the way for innovative urban design. Tange envisioned using one grand axis, which would cross Tokyo Bay and provide the platform for imaginatively designed buildings. Kenzo Tange designed Yamanashi Broadcasting and Press Centre in the town of Kofu in 1966. In this building, he displayed his knowledge of maximizing space. The building incorporated three different media companies – Radio station, newspaper printing plane and television studio. Tange grouped the similar functions of each company in the same floor. For example, the studios on the same floor while the office space at the top. The glass walled office design of Tange can be seen in numerous buildings all over the world today. He even left enough space within the building for future expansion. This space has now been converted into terraces and gardens. The sign of genius is the ability to see into the future, or future problems and devise solutions for them. Kiyonori Kikutake is another of Japanese visionary architect who was perhaps the one of the first architects in the world to design sustainable buildings. He designed the outstanding ‘Marine City’, which proposed the concept of a metropolis which would float on the ocean. As per his unique design, the floating city would be sustainable, clean, flexible and earthquake proof. The design of the city was such that it was situated at a distance from the teeming Tokyo city on mainland Tokyo. Large steel rings would hold the floating city’s circular foundation in place. He conceived the foundation of the city to be comprised of bottle-like forms, which could create a rich aquaculture industry. Kikutake’s original and innovative idea was radical for the times, but now it seems quite reasonable. In fact, we have seen floating buildings in modern times, which were possible inspired by Kikutake’s design. Kiyonori Kikutake’s vision makes him one of Japanese visionary architects. His designs are an example of the avant garde architecture movement which sought to fuse artistic design with modern technology. Arata Isozaki was another notable participant of the Metabolism movement in Japan. His design for the ‘City in the Air’ was first put forward in 1960. His plan for the city was a multi-layered city, which had parking lots and highways interwoven between apartment and office compounds. In the amazing design of the suspended city, the structures resemble trees, growing next to each other. The branches functioned like passageways to residential units, while the tree-trunk like structures functioned as huge supports. 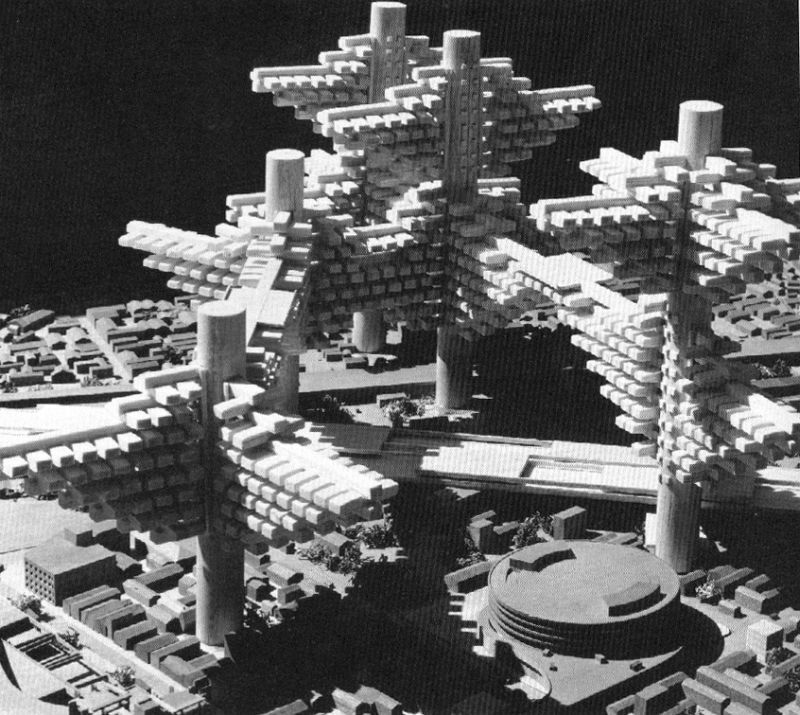 This project of Arata Isozaki was also known as ‘Clusters in the Air’, as the tree like structures created the look of a concrete forest cluster. This design made Isozaki one of the Japanese visionary architects. Kisho Kurokawa was another Japanese visionary architect who was one of the leaders in the Metabolism movement. 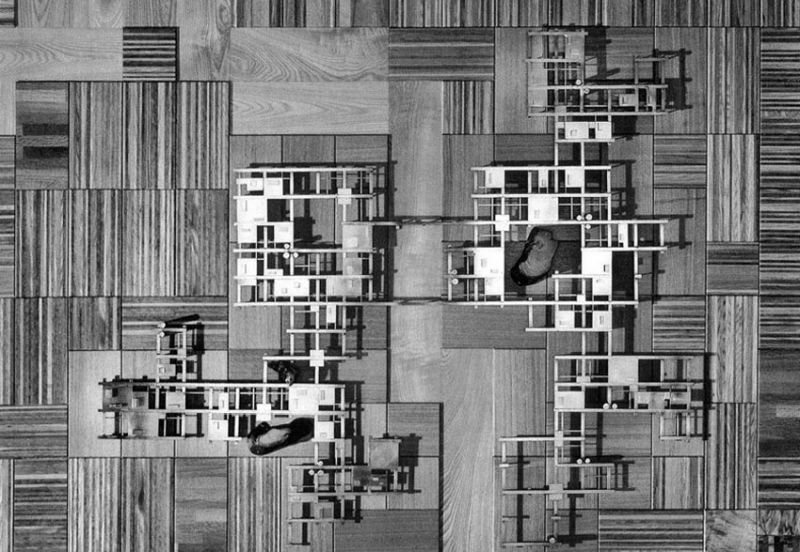 He proposed the ‘Helix City’ as a solution for the space constraints in Japanese cities. ‘Helix City’ comprised of organic design which had interlinked, helical structures. The city relied upon service towers which would be connected by numerous bridges over land and sea. Residential buildings fill in the gaps between the buildings/towers. This created a pattern that could continue endlessly (hypothetically). 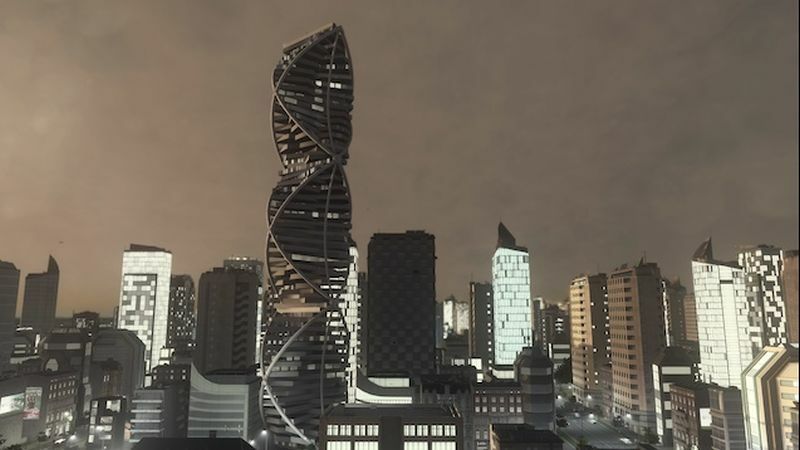 ‘Helix City’ design was inspired by the discovery of DNA (which also has a helical structure) in 1953. 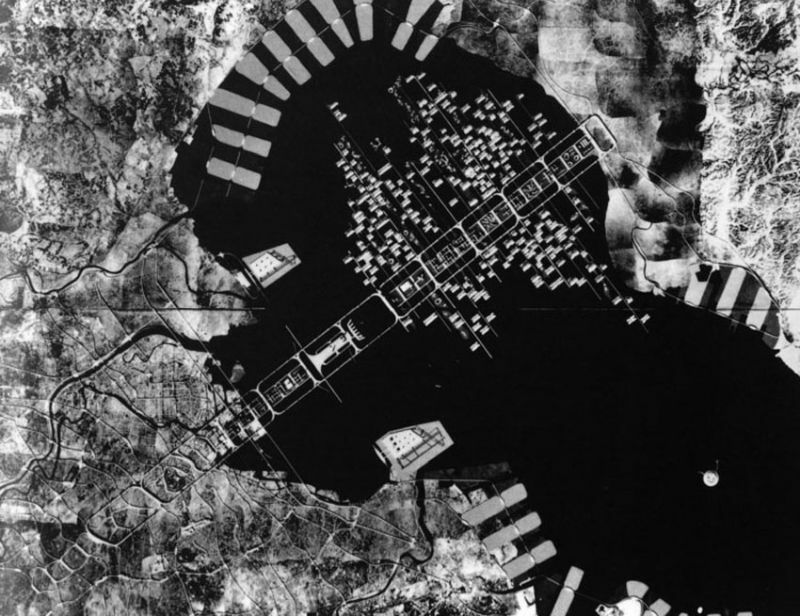 Japanese visionary architects Kurokawa designed the ‘Agricultural City’ in response to his escape from the Ise Bay Typhoon, which occurred in 1959. He envisioned this city to survive the onslaught of flood, by using grid like structures. These concrete slab structures were raised on some stilts, on agricultural soil, in order to synchronize rural landscape with the urban. The grid’s design provided for water services, road, electricity, monorails, schools and administrative offices. The houses are mushroom shaped, had 1-3 floors, wooden frames and aluminum cap. The houses were separate units, but were linked together to form a village. It had enough space for 200 people, and the structure could grow as well as change as per the requirement. 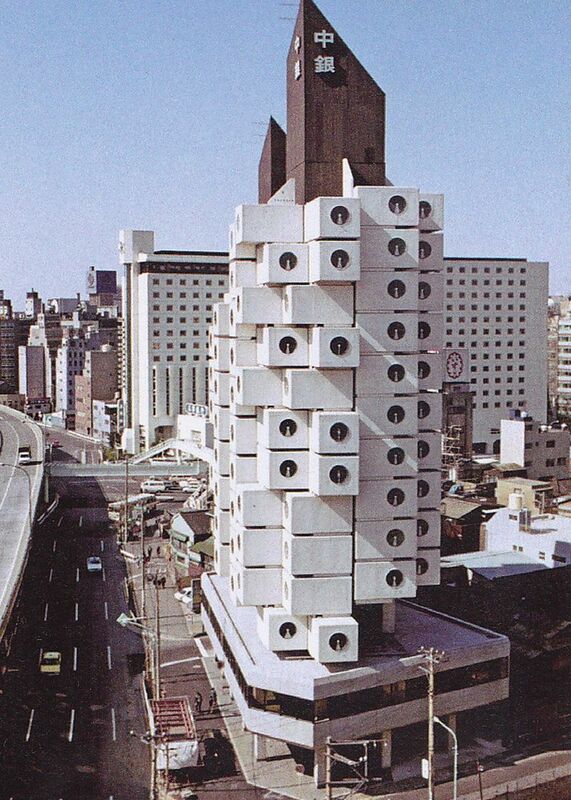 Kurokawa and his team designed this capsule building for people to stay during the week. It is one of the first prototypes building that stressed on recyclability and sustainability. When needed, the 140 modules can be added, exchanged or replaced to the building’s central core. The designs of the Japanese visionary architects addressed the problems which we are facing almost half-a-century later. They had already seen the future and designed innovative solutions, which were adaptable, interchangeable, and sustainable. Modern architects have been inspired by their thought to design buildings that are self-sustaining and provide space for urban dwellers.